The picture above shows the velocity triangles for one axial compressor stage. 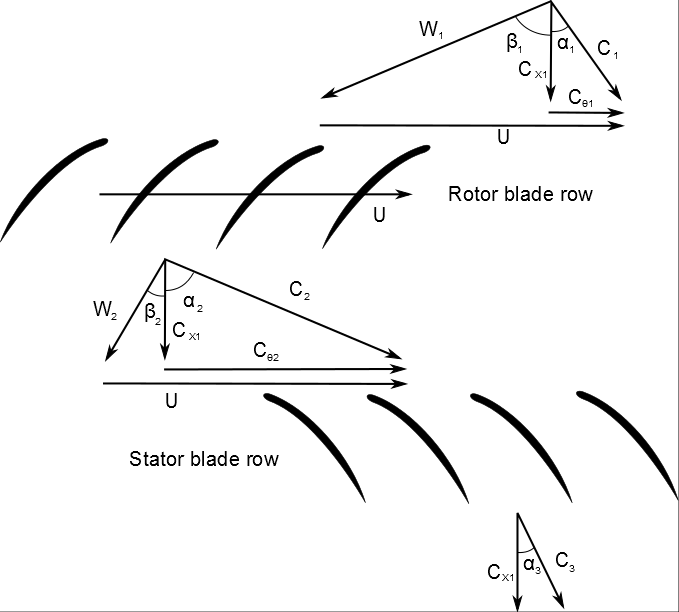 You can see that a big factor for the angle at which the airflow leaves the rotor, is strongly dependent on U the rotational speed of the rotor. So when the engine runs at different powersettings the air is gone come at the stators at different angels(since U is changing). Since the stators are like wings and have an optimal angle of attack, it makes sense to make them rotate so they can always keep this optimum angle, even if the oncoming flow changes its angle. So it doesn't really have much to do with whether the plane is on the ground or not, the major factor for the stator adjustment is the changing rotational speed of the compressor rotors. Where did you read this? Variable Inlet Guide vanes (VIGV's) have many different names across different engine manufacturers, but the principle is the same, a number of stator stages are operated mechanically to maintain compressor efficiency across the RPM range the engine operates dependant on altitude, demand etc, it doesn't strictly work on the ground. Not the answer you're looking for? Browse other questions tagged jet-engine turbine or ask your own question. What would happen if the entire blade on a turbojet engine went supersonic?